Welcome to the McWilliam Park Hotel a splendid 4 **** Hotel where you will find a superb ambiance, top class service and staff with the only goal in mind to ensure your visit whether business or leisure is a memorable one and that you are leaving with the lasting memory of a wonderful hotel. 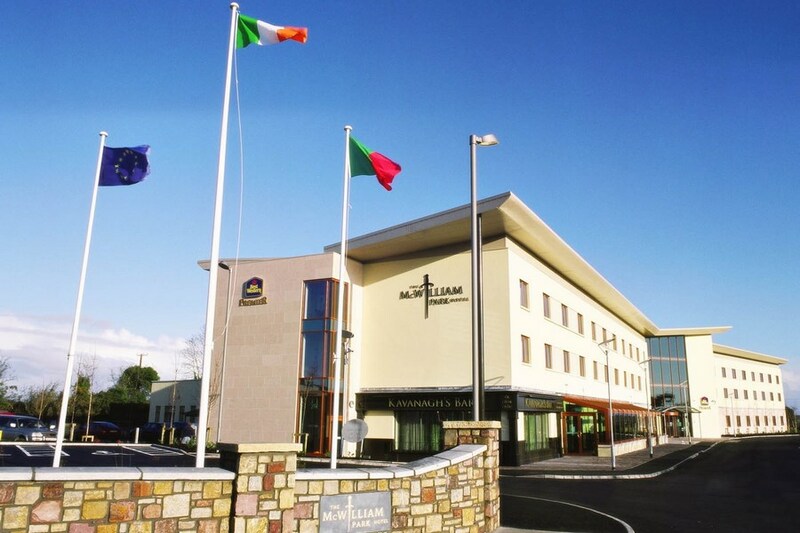 Located a ½ mile from the thriving market town of Claremorris in the heart of the West off the N17 half way between Galway & Sligo and only 30 minutes from the rugged Atlantic coastline surrounded by plains, rivers & lakes and with a backdrop of Croagh Patrick the Nephin Mountains & the Partry Mountains. Located beside the thriving market town of Claremorris in the heart of the West of Ireland off the N17, half way between Galway and Sligo. Traveling distance from Ireland West Airport Knock is only a 15 minute drive to the hotel. Claremorris Town has one of the busiest railway stations outside of Dublin. Great hotel, breakfast is very good. Room had lots of space. We have a fantastic stay, friendly and accommodating staff. Lovely hotel, helpful staff . Swimming pool was great. But had a big issue with the way payment was taken from our visa debit card. Full payment was taken from our account on arrival (actually debited from our bank account). Then the full amount plus some extras was debited to our card on the morning of departure resulting in us paying twice for the stay. I rang the hotel to query why our account was actually debited twice and they said it was our banks fault and the pre-authorisation amount should be returned to our account with 5 to 10 days. Our bank said it was the way the hotel handled the transaction that was the fault. Either way we are without the money for several days while we wait for someone to refund us. Not satisfactory. We had a very enjoyable stay at McWilliam Park Hotel. All the staff were excellent and what they do, very friendly and helpful, this makes a hotel what it is in my eyes. We had an excellent meal in the restaurant on the first night, great quality and choice, there was no problem mixing between the a la carte and table d'hote menus. Breakfast was more than adequate and nothing was too much trouble for the staff. The children really enjoyed the leisure center although the changing rooms are very small and can get very busy. The hotel is very clean and well maintained. In fact they were painting the corridors on the second floor while we were there, which wasn't a problem, in fact it was great to see. There isn't much to do or see in Claremorris, but we went away to just relax and do nothing so it suited us to the ground. I would definitely recommend McWilliam Park Hotel and would return without hesitation myself. I found the hotel lovely .The rooms were clean and spacious. The staff were very friendly. WE were delighted with our stay and the staff couldn't be more helpful. The room was lovely and warm. We will definately go back. 18 - 21 Oct. 2013 Excellent Hotel. The rooms were very clean and comfortable, and the staff friendy and helpful. We had our meal in the restaurant on the Friday night which was delicious, we had Bar food too and it was very good. The only fault we had was that Wifi was not available in the Bedrooms. Myself and my friend had Facial Treatments in the Spa carried out by a very friendly and professional girl. While the hotel is in a good location, it is a ten minute walk to the Town Centre. I found our room was a family room with four beds in it which left it cluttered looking . All the surfaces were dusty but when I explained this to the receptionist she called the manager and he got it cleaned. The staff were very pleasant and the meals were excellent. Hotel was excellent - staff very friendly - rooms and food really good. Would strongly recommend this hotel. Great place to stay if touring around Mayo and really near Knock - national shrine to Our Lady. Hotel really nice but bedrooms could do with better reading lamps beside beds! My 2 children & I stayed at this hotel on saturday night february 2nd 2013 . The whole family have stayed here on a number of occasions before. This is a good hotel the staff are wonderful, the food is good, & the hotel is clean and comfortable . We will be back again & the kids love the pool . Edward from Kerry. Lovely Hotel. Friendly & helpful staff. Will be back. My wife Carmel and i went for short a break to the McWilliam Park Hotel and found it probably the best we have stayed in yet.We found the hotel to be very reasonable,food was of a high standard and room exceptional all the staff very friendly and accommodating,bar prices a lot cheaper than the bars in Dublin.We have already recommended to friends and family. all in all we will definitely be back for another visit. A big thank you to all at McWilliam Park ..
Super hotel. Good location. Can't find fault with it. stayed here with my boyfriend for the second time and as before, we both felt very welcome, we would definately recommend this hotel to our friends and family and will most definately be staying here again. thanks to all staff at the mcwilliam park hotel for making our stay as comfortable and memorable as before. 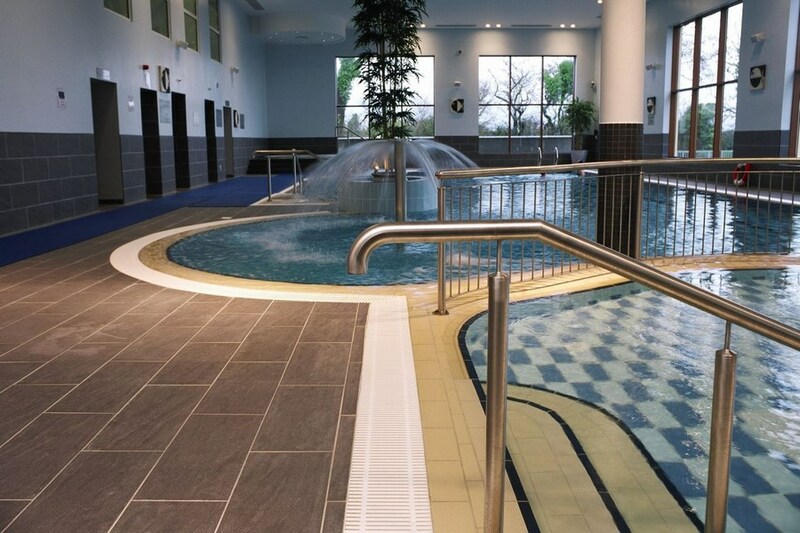 Booked 5 rooms in the McWilliam Park hotel for extended family. I must say that I could not fault this hotel in any way. At this stage, I have stayed in a lot of Irish hotels and this hotel for me definitely ranks in the top range. The room itself was fine, but we all thought that a fridge would be an added bonus in the room. The food in the restaurant was excellent. On some evenings we had our dinner in the bar, good selection, but a few of my family would have preferred if the food was a bit warmer. They should have asked for it to be re-heated, but didn't. A special mention to Gerard in the bar and restaurant whom we found to be extremely friendly, helpful and an all round lovely chap. The majority of the staff were irish, which I must say makes life a lot simpler for everyone! There was music in the bar one night when we were there, which we thoroughly enjoyed. 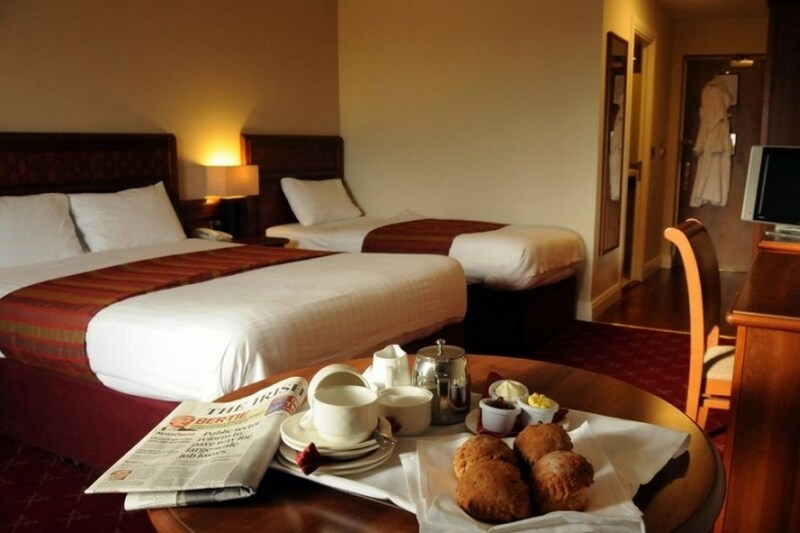 The hote is ideal for anyone who wishes to visit Knock, as it is about 15 mins by car from there. The leisure centre is great and the morning we went there was very quiet. The opening hours for the leisure centre is very good also, in comparison to some hotels. Two of our party had shoulder and back massages in the beauty salon, which we enjoyed and we found quite reasonable. Overall, a very enjoyable stay had by all and I would definitely have no hesitation in recommending this hotel. Stayed here on 22nd and 23rd August '11 Nice modern hotel. Room was well equipped with coffe/tea facilities and iron/board, wifi etc. Tv had very bad reception. Very nice staff at reception and dining room. Breakfast had the usual serve yourself area and your main order was taken by staff and was of very good standard. The dinner on offer at 35 euro wasn't particularly good value-could have been reduced for residents. The leisure centre was quite nice but not supervised directly. This meant that some rules were ignored by some eg parents wearing shoes into pool area, 'bombing, running. The hotel is easy to access from the main road and is within walking distance of the town. There is a very nice restaurant - The Arches- in the town-highly recommended. Altogether the hotel to stay in in in mid-west Ireland. Had a very very relaxing and enjoyable stay in the McWilliam Park, food, staff and service excellent, hope to return soon again. Perfect hotel for a family break. Staff very capable and friendly. No hesitation recommending the Hotel and area in general for an excellent holiday. Hotel was very good value for money. It was very clean and the staff were very friendly and helpful. Must admit it was very nice to have Irish Staff - no problems understanding on either side. The leisure facilities were excellent.